Mitochondria of Vorticella convallaria like other ciliates, have tubular cristae arising from their inner membranes. However, they also have a bundle of filaments (DNA?) that extend through the center of the organelle. TEM taken on 4/5/71 by R. Allen with Hitachi HU11A operating at 75kV. Neg 17,150X. Bar = 0.5µm. The negative was printed to paper and the image was scanned to Photoshop. This digitized image is available for qualitative analysis. 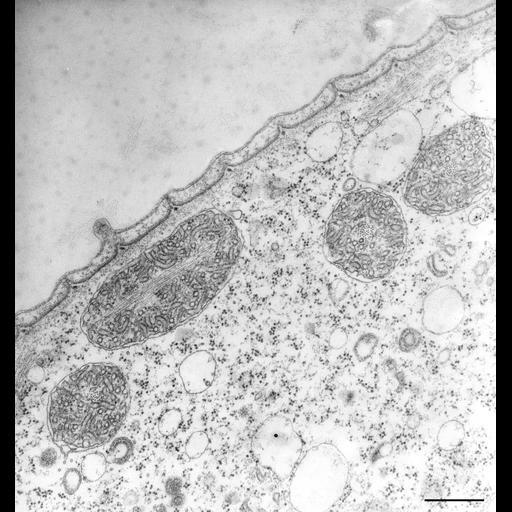 A high resolution image (CIL:39451) is available for quantitative analysis. Additional information available at (http://www5.pbrc.hawaii.edu/allen/). Standard glutaraldehyde fixation followed by osmium tetroxide, dehydrated in alcohol and embedded in an epoxy resin. Microtome sections prepared at approximately 75nm thickness. Additional information available at (http://www5.pbrc.hawaii.edu/allen/).